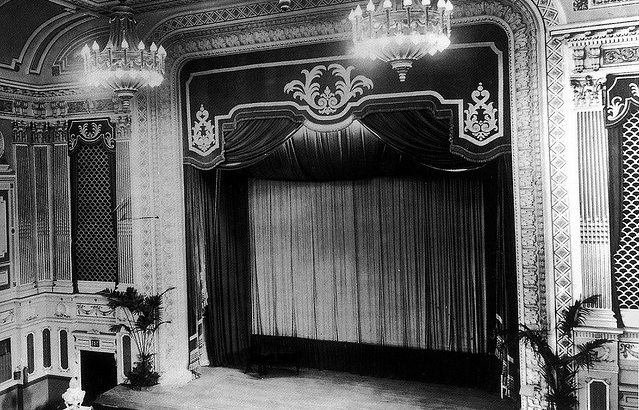 In February 1896, this hall welcomed some of the first audiences in Britain to see projected moving pictures. If for no other reason, it’s an important place in London’s – not to mention Britain’s – cinema history. At the time, it was part of the Regent Street Polytechnic Institute; it’s now part of the University of Westminster. In a little while, the space is due to close for renovation work and, all going to plan, it will reopen in 2015 as the Regent Street Cinema. Although it started out (and is currently used) as a lecture theatre, the hall has also been a commercial cinema for much of it’s history and it still bears some of the signs – like the Compton organ, installed in the 1930s. Over the course of the renovations, some of the layers of this history will be stripped back and new features added. It’s an interesting mix of urban conservation (the current phase of the project is being part-funded by the Heritage Lottery Fund) and new development. The project still needs money, though, so if you’re interested in contributing, you can make a donation via the website: www.birthplaceofcinema.com. Thanks very much to James Williams, the development officer on the project, for showing me around. I’m looking forward to seeing what the finished place looks like, and to finding out what other remains of cinema history the builders uncover in the coming months. 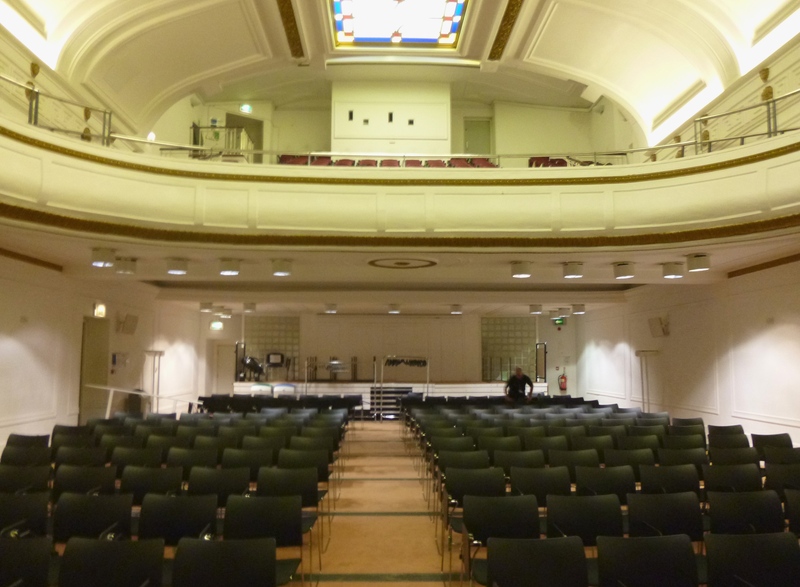 In the University of Westminster’s Regent Street lecture hall, looking up towards the gallery (added in the 1920s), with the projection box at the back. There’s a detailed account of the first films shown at the Regent Street Polytechnic in Joost Hunningher’s essay, ‘Première on Regent Street’, in Christopher Williams, ed., Cinema: The Beginnings and the Future (London: University of Westminster Press, 1996). There’s more about the venue’s history as the ‘Poly’ cinema at the Cinema Treasures website. I’m celebrating this blog’s first birthday with a trip ‘up West’ to one of the focal points of London’s filmland, Leicester Square. I also wanted to spend a bit of time here because I’ve been thinking about a question posed early in 1913 by a writer in one of the film trade papers: who was the audience for the first West End cinemas? What the writer, Samuel Harris, actually wanted to know was whether there was a public demand for the expensive new picture palaces appearing on thoroughfares like Oxford Street and Shaftesbury Avenue. London theatregoers, he thought, had little choice but to travel to the West End if they wanted to watch the latest stage shows. But, seeing as there were ‘far more cinema theatres by hundreds outside the West-End than there are theatres and music-halls’, and given that these cinemas generally showed the same films as those in the West End, would cinemagoers from the suburbs or further out really go the extra mile to get something already available closer to home? Plus, if West End cinemas did manage to attract regular patrons, would these be the same people who went to West End theatres and music halls? In fact, he wondered, ‘Where do the West End regular theatre audience come from’ in the first place? Harris was an estate agent whose firm brokered some of the big West End cinema projects, so he had a personal interest in asking these questions. I’m not able to answer them all yet. But a trip to Leicester Square might provide a bit of background on the West End as a destination for amusement-seekers. 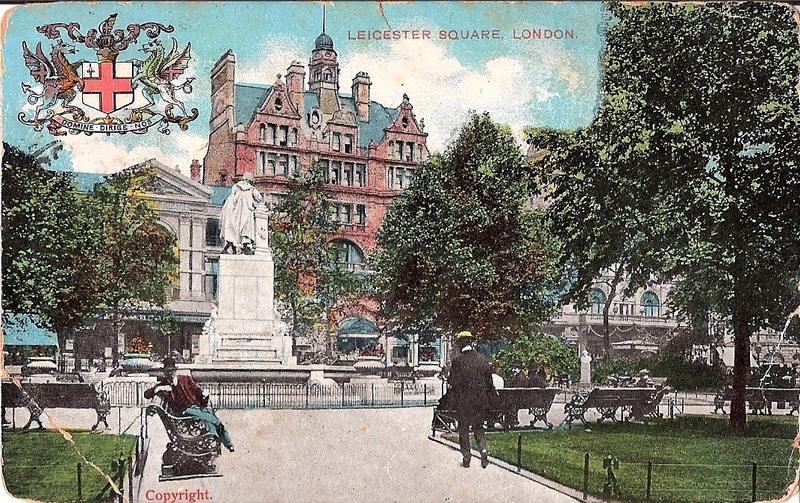 Looking towards the north side of Leicester Square from a postcard sent in 1906. 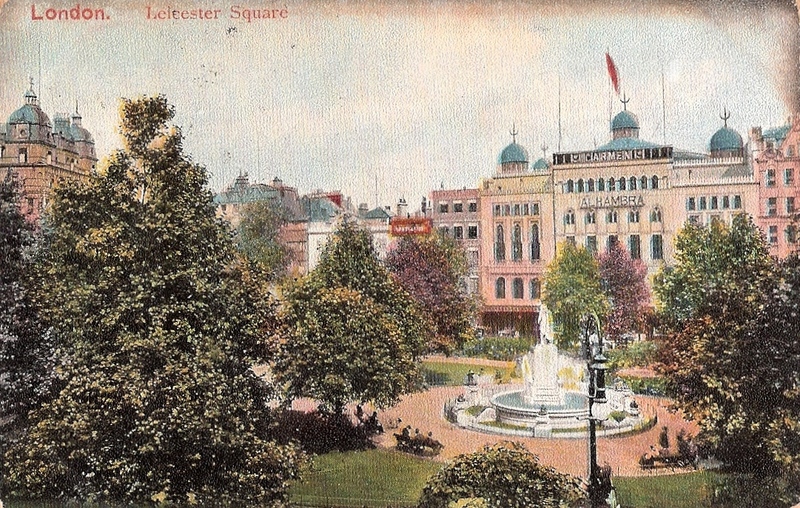 Originally, Leicester Square was a residential spot. It was laid out and railed off from the surrounding Leicester Fields in the seventeenth century as a decorative accompaniment to the stately Leicester House. During the eighteenth century, it was hedged in by private houses – home to aristocrats and artists like William Hogarth and Joshua Reynolds. There were a few shops by this point, but in the nineteenth century commerce more or less took over. Residences made way for a wave of hotels, shops, exhibition centres, institutes and museums. Compared to some of London’s other squares, this was quite a dramatic transformation. The architectural historian E. Beresford Chancellor wrote that, ‘from being as much a private square as those of St. James’s or Bloomsbury, Leicester Square has become as much a public “place” as Trafalgar Square or the Place de la Concorde’. This commercialisation points to something that was happening more widely in the West End at the time. Wealthy residents were moving out of the area to the suburbs, leaving the major theatres (including the old patent theatres at Covent Garden and Drury Lane) in need of a new audience. 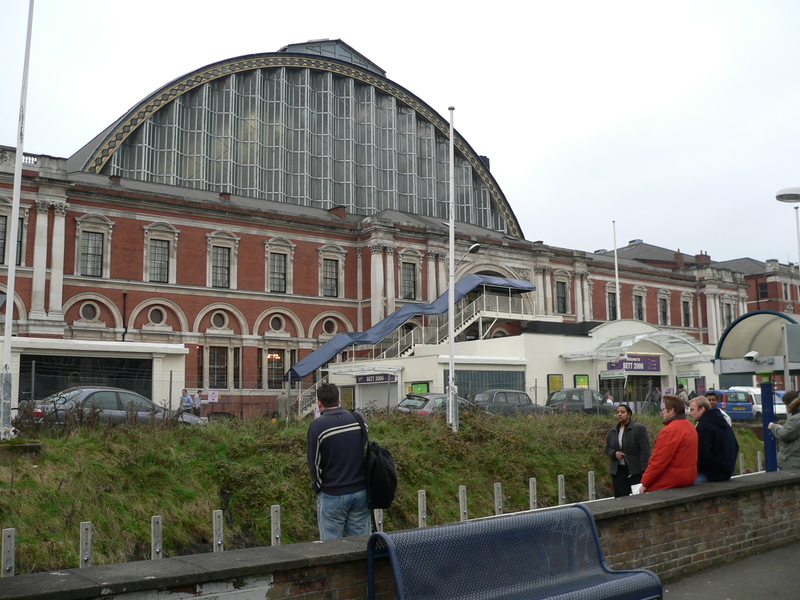 In their book on nineteenth century theatregoing, Jim Davis and Victor Emeljanow suggest that the Great Exhibition of 1851, which attracted upwards of 6 million tourists to London in the space of five months, gave theatre managers a feel for how they might make up for the loss of their old, local clientele. The solution managers came up with (according to Davis and Emeljanow) was to turn the West End into a kind of theatrical ‘theme park’, unique enough to entice tourists into the area. In Leicester Square, an important model for capitalising on the emerging tourist trade was provided by James Wyld, whose Great Globe stood in Leicester Square gardens from 1851 and continued to pull in visitors for several years after the Exhibition closed. The north side of Leicester Square, ca 1904, showing the Empire, the Queen’s Hotel and Daly’s Theatre, with the London Hippodrome in the distance. The Great Globe vanished (replaced, until the 1870s, by what Beresford Chancellor described grimly as ‘a wilderness … and a last resting-place for dead cats’), but other attractions sprung up in its place. 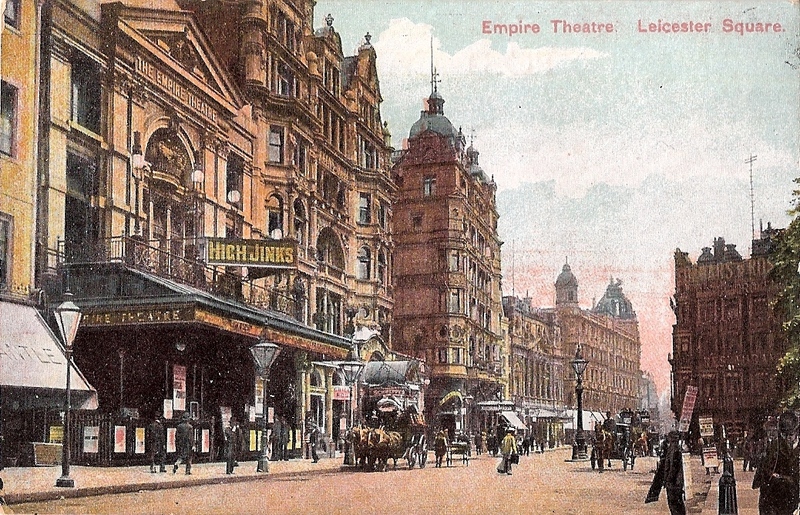 By the turn of the century, Leicester Square was dominated by two huge variety theatres – the Alhambra on the east side, the Empire on the north – plus Daly’s Theatre just off the square on Cranbourn Street. There was also the Queen’s Hotel, the Hôtel Cavour (the first of the square’s ‘foreign’ hotels), and a number of shops, clubs and restaurants. The Alhambra and the Empire both showed films from 1896 as part of their variety programmes. But the first dedicated cinema, the Circle in the Square (also known as the Bioscopic Tea Rooms, and afterwards Cupid’s and the Palm Court), opened in 1909 next to the Alhambra. This was the only full-time film venue on the square until the Empire was rebuilt as a flagship cinema for MGM in 1928. 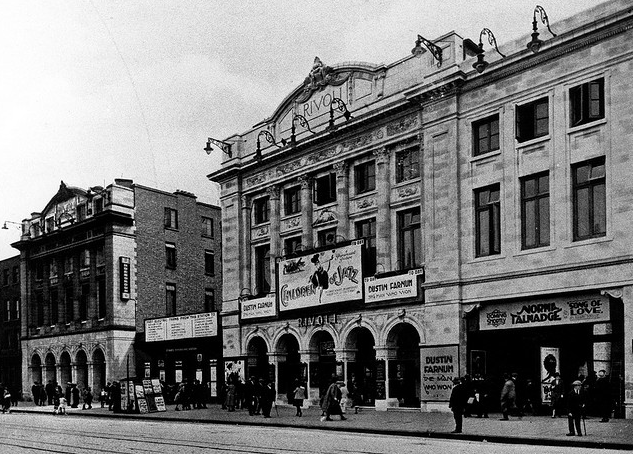 The Alhambra was knocked down to make way for the Odeon in 1936. But there were other early cinemas nearby: the Cinema de Paris on Bear Street opened in 1910, and the much grander West End Cinema Theatre on Coventry Street opened – in the presence of royalty, no less – in 1913.
Who might have been in the audience at these early Leicester Square cinemas? We can guess that foreign and provincial tourists, who visited the Empire and the Alhambra, and who stayed in the area’s hotels, might have also visited the cinemas. So, too, might Londoners in search of some controlled naughtiness. Judith Walkowitz sums up the prevailing culture of Leicester Square around this time as a mixture of ‘foreigness’ and British chauvinism: ‘Sufficiently cosmopolitan to appeal to foreign tourists … as well as to Londoners desirous of a touch of the Continent’. The Cinema de Paris on Bear Street could have been named with exactly these potential customers in mind. The east side of Leicester Square, ca 1903. The Circle in the Square cinema opened in the building to the right of the Alhambra in 1909. Early Leicester Square cinemas were also well placed to appeal to passing trade. When they opened, the Circle in the Square and the West End Cinema operated a policy of continuous performance, showing films Monday to Saturday from about midday to midnight (and Sundays from 6pm). Positioned next to the Alhambra and the Empire and near the theatres on Shaftesbury Avenue, they would have been in a good position to attract variety patrons waiting for the 8pm performance or playgoers on a night out. During the day, they might have been a stopping point for shoppers en route between the big department stores on Oxford Street and Regent Street and the railway stations at Charing Cross and Waterloo. If they wanted to, passersby were also able to come in just for something to eat: the Circle in the Square had tea rooms adjoining and underneath the auditorium and the West End Cinema had a ‘Balcony Tea Lounge’ that served drinks and snacks. All this suggests that cinemas could have shared the audience for other West End amusements without necessarily competing with them directly, in the same way that earlier Leicester Square attractions were able to cash in on the tourist trade drummed up by the Great Exhibition. What I’d still like to know, though, is whether these early film venues brought any new visitors to Leicester Square – perhaps people who might not have been able to afford to go out there otherwise, or who might have been put off by the social niceties of West End theatregoing. Tickets at the West End Cinema were as pricey as those at the nearby theatres, but the Circle in the Square seems to have been a bit cheaper. There, customers could watch a film and enjoy a cup of tea for the same price as a seat in the pit at the Alhambra. Could the arrival of film have opened up the West End to new audiences – new ‘cinematic’ tourists? There’s more digging to be done before I feel confident answering this question. But, as Leicester Square emerges from its recent multi-million-pound makeover, carried out (according to mayor Boris Johnson) to guarantee its status as a ‘beacon for world premieres and the stars of the silver screen’ and, consequently, as a ‘must-see destination’ for tourists, it’s interesting to think back on what impact film might have been having on the square and its visitors 100 years ago. 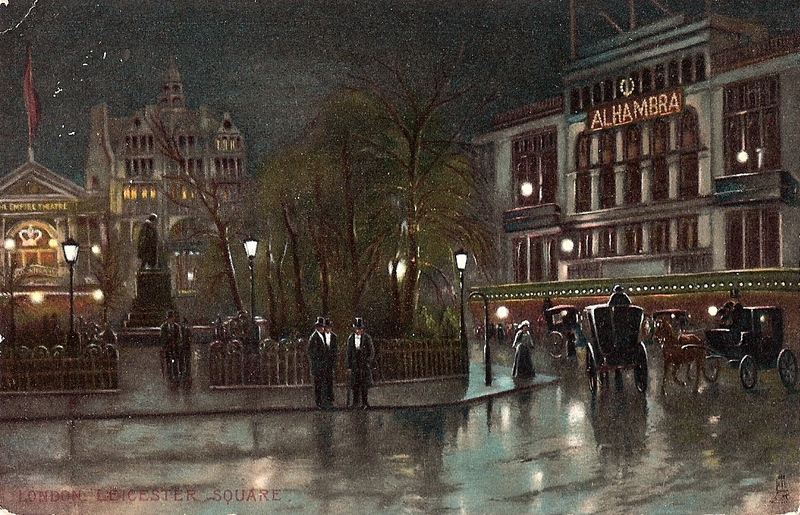 Leicester Square at night, from a postcard sent in 1904. Samuel Harris, ‘Thoughts that Make Us Pause and Ponder – No. 2’, The Cinema (29 January 1913). E. Beresford Chancellor, The History of the Squares of London (London: Paul, Trench, Trübner: 1907). Jim Davis and Victor Emeljanow, Reflecting the Audience (Iowa: University of Iowa Press, 2001). Judith Walkowitz, Nights Out: Life in Cosmopolitan London (New Haven: Yale University Press, 2012). Lauren Turner, ‘New Look Leicester Square Opens’, The Independent (23 May 2012). Will you go with me to HALE’S TOURS at 165, Oxford Street, W.? We can visit the Colonies or any part of the world (without luggage!) and return within fifteen minutes. Trains leave frequently from eleven to eleven. It is not only educational but intensely interesting. So read the message on the back of the postcard pictured above. It advertises one of two (possibly three) Hale’s Tours venues that opened on Oxford Street from 1906. 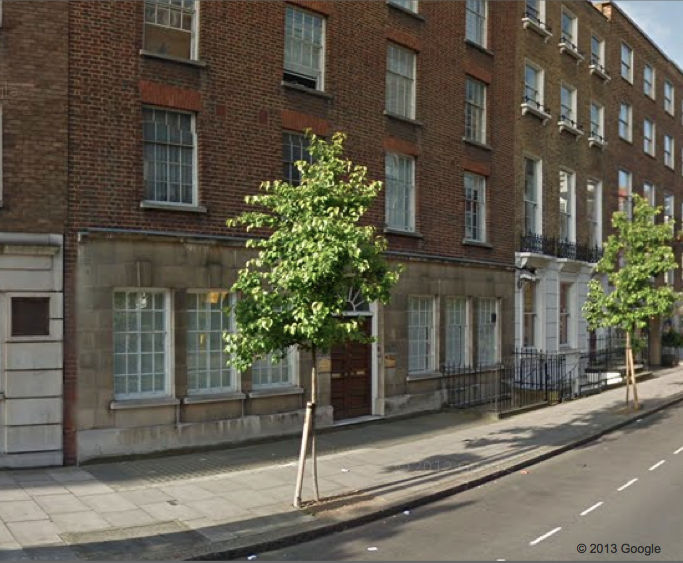 Another was located in the building at number 532 Oxford Street near Marble Arch, and, according to Christian Hayes, there might have been a third on the corner with Argyll Street. By 1908, London had two more Hale’s Tours sites operating at Hammersmith Broadway and Kensington High Street. The wonder of the 15-minute round trip to Britain’s furthest-flung colonies and beyond was available to about 50-60 people at a time for the uniform price of sixpence. But how was it achieved? 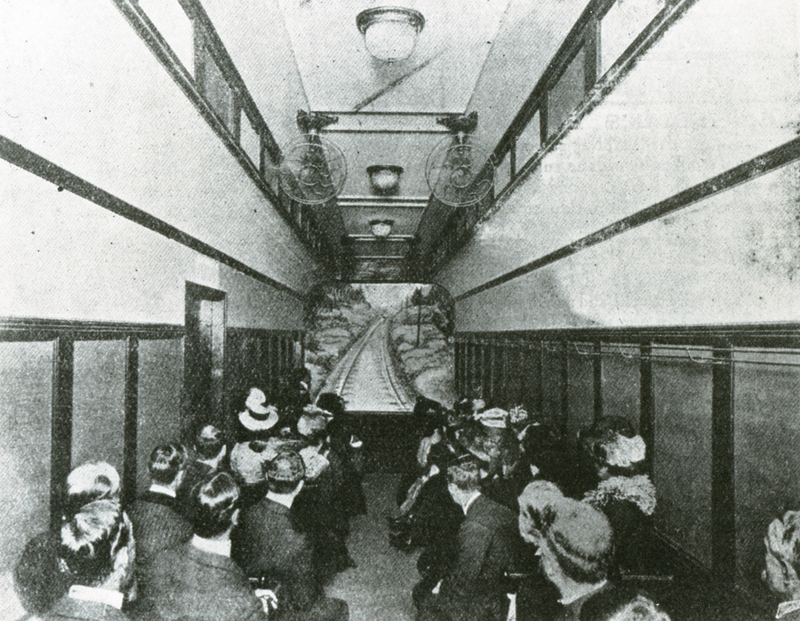 The attraction, first introduced at the 1904 St Louis Exposition by the entrepreneur George C. Hale, worked like a modern theme park simulator ride. The venue was made up of one or two carriages, decorated like the inside of a train, except for the fact that there were no windows. Instead, at one end facing the audience was a screen showing moving pictures of passing scenery. Some of these moving pictures were repurposed or specially commissioned ‘phantom rides’. But there are also records of Hale’s Tours venues showing story films like Edison’s The Great Train Robbery. The effect wasn’t just visual. Although they never left the premises, Hale’s Tours carriages were designed to rock, tilt and vibrate to mimic the feel of a train journey. The ‘passengers’ at some venues were also treated to uniformed attendants, fans blowing a breeze overhead, and the sound of wheels, bells and whistles to add to the illusion. In the journey through Rome, one could readily believe we were on a tram car; the rumbling of the wheels, the clanging of the bell to clear the traffic, the motion of the vehicle when rounding corners and the other effects were well-timed, free from exaggeration and as natural as one could desire. But realism wasn’t the only thing on offer. Lauren Rabinovitz suggests that the effect of Hale’s Tours wasn’t just to transport viewers vicariously to distant places, but also to capture the sensations associated with modern technology – the same kind of miniature thrill offered by the rollercoasters on turn-of-the-century amusement parks. If Hale’s Tours brought ‘the Colonies’ and a patch of the fairground within reach of shoppers along Oxford Street, there’s also an argument to say that the attraction opened up the West End to the idea of places exclusively showing moving pictures. By the time Hale’s Tours in Britain went bankrupt in 1908, there were at least two full-time cinemas in the district. One of these, the Theatre de Luxe on the Strand, had previously been trading as the Tivoli Tourist Station – a rival attraction to Hale’s. A little later, the former Hale’s Tours venue at 532 Oxford Street also became a cinema. While they lasted, though, Hale’s Tours weren’t just about the films. They sold themselves on a full, immersive experience. The inside of a Hale’s Tours carriage. Christian Hayes, ‘Phantom Carriages: Reconstructing Hale’s Tours and the Virtual Travel Experience’, Early Popular Visual Culture, 7:2 (2009), 185-198. Raymond Fielding, ‘Hale’s Tours: Ultrarealism in the Pre-1910 Motion Picture’, in John L. Fell (ed. ), Film Before Griffith (Berkeley: University of California Press, 1983), pp. 116-130. Stroller, ‘Picture Shows As I See Them’, Kinematograph and Lantern Weekly (1 October 1908), 481. Lauren Rabinovitz, Electric Dreamland: Amusement Parks, Movies, and American Modernity (New York: Columbia University Press, 2012). In modern Olympia all wishes fulfil. 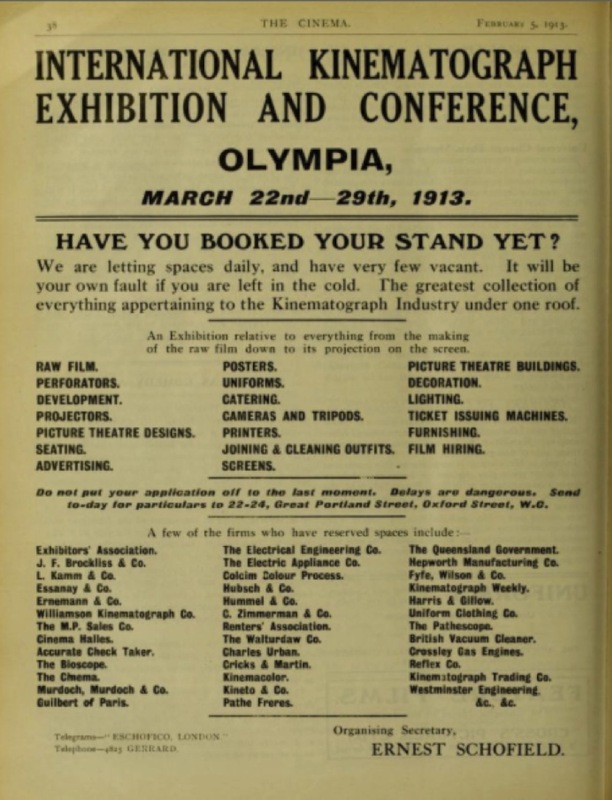 Exactly 100 years ago today, the First International Cinematograph Exhibition opened at London’s Olympia. 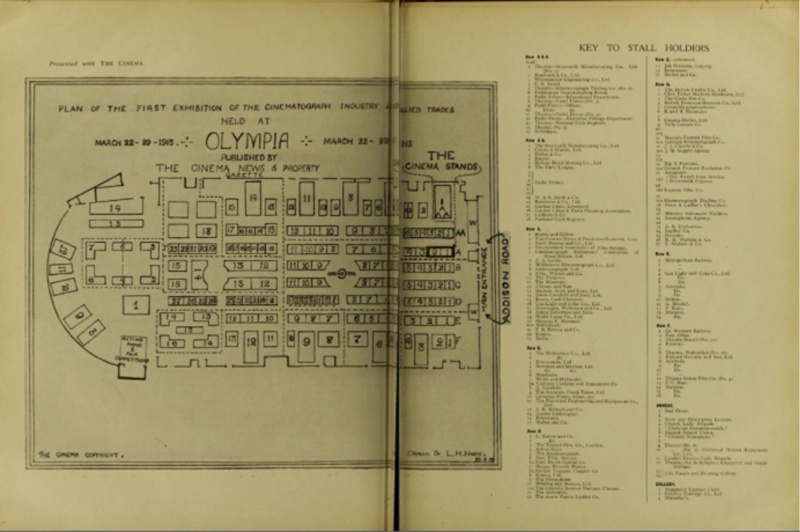 The Exhibition ran from March 22 to 29, 1913, bringing representatives from various branches of the film business together under Olympia’s massive, barrel-shaped roof. The programme set forth is most comprehensive in its nature, dealing with every phase of the industry, from the manufacture of the raw film to the finished image on the screen … Quite apart from its purely commercial side, the exhibition reveals, for the first time, the marvellous advance of cinematography. It is with no small pride that the Trade can regard its progress – unbroken, steady and continuous; and it is only fitting that its history and romance should be unfolded in such a manner. …The British Isles, too, is dotted from end to end with cinema theatres, the owners of which in many instances are either too busily occupied or have neither the time nor the opportunity for periodical visits to London and have to rely for the knowledge they gain of what is doing in the cinema world upon the columns of the trade Press. The show has been visited by quite a number of picture celebrities. Many of the film producers have had their actors and actresses ‘on view’ at their stalls, and the Éclair Company, whose projection theatre has been thronged continuously, brought over Funnicus, Jane, and Softy, whose portraits are so well-known to all moving picture devotees to enable them to make a closer acquaintance with them. Besides these, there were representatives from institutions whose relationship to the film business was a bit hazier – groups like the Red Cross and the Boy Scouts, and organisations promoting the garden city movement or even emigration to Australia – but who presumably thought that the Exhibition represented a good opportunity to reach new audiences. My most lasting impression of the exhibition is as of one amazing wonder journey, similar to the experiences of my boyhood, when I first discovered some of Nature’s beautiful treasures. I congratulate the Trade on its achievements, and on the rare qualities of its representatives. At all stands I found men and women filled to the brim with fine enthusiasm for cinematogrpahy, and capable of so talking about it as not only to give wholesome pleasure but also useful instruction. I don’t know whether the Cinematograph Exhibition succeeded either in its aim of generating business for the British film industry or promoting its usefulness as an educational tool. But it’s worth commemorating, I think, as an example of how the early film trade tried to project itself in the public eye, and as a reminder of the different kinds of activity that made up ‘cinema’ in Britain 100 years ago. 2. Bamforth & Co., Ltd.
3. Westminster Engineering Co., Ltd.
1. The Hepworth Manufacturing Co., Ltd.
2. Cricks & Martin, Ltd.
5. Roll-up Metal Matting Co., Ltd.
13. W.&R. Jacob & Co.
14. Rowntree & Co., Ltd.
2. The Cinema News & Property Gazette, Ltd.
3. Keith Prowse and Co., Ltd.
5. Cinematograph Exhibitors’ Association of Great Britain, Ltd.
7. Williamson Kinematograph Co., Ltd.
9. Fyfe, Wilson and Co.
13. Hudson, Scott and Sons, Ltd.
14. James Crosfield and Sons, Ltd.
15. Gas Light and Coke Co., Ltd.
17. Burroughs, Wellcome and Co., Ltd.
18. James Robertson and Sons. 19. Webb Lamp Co., Ltd.
21. F.R. Britton and Co.
1-2. The Walturday Co., Ltd.
4-5. Newman and Sinclair, Ltd.
7a. Uniform Clothing and Equipment Co.
9. The Accurate Check Taker, Ltd.
10. Criterion Plates, Films, etc. 11. The Electrical Engineering Equipment Co., Ltd.
1-2. L. Kamm and Co.
6a. Emil Busch Optical Co.
7a. British Vacuum Cleaner Co.
10. Whiting and Bosisto, Ltd.
12. The Acme Patent Ladder Co.
1. The British Uralite Co., Ltd.
2. Chex Ticket Machine Syndicate, Ltd.
3. The Globe Pen Co.
4. British Thomson-Houston Co., Ltd.
11. Martin’s Feature Film Co.
12. J.J. Chettle & Co.
14a. Central Feature Exclusive Co.
26. N.B. Walters & Co.
27. S. Walker & Co.
4-6. Gas Light and Coke Co., Ltd.
7. Richard Hornsby and Son, Ltd.
10. Theatre (No. 7) Universal Screen Equipment Co., Ltd.
2. Cradley Carriage Co., Ltd.
After spending a while in the West End, I thought it was time that London Filmland ventured east. Following a tip-off from the erstwhile Bioscope, this post stops off at 100 Whitechapel Road, the former site of two film-related venues: the Rivoli and, before that, Wonderland. As a stalwart of the East End entertainment scene, there’s been a fair amount written about the place already, so this is an attempt to pull together information on some of the venue’s different encounters with film over the years. Wonderland first opened its doors as a music hall in 1896, which was also when the site’s life as a film venue began. But it had been associated with entertainment since the 1830s, first as the Earl of Effingham Saloon, then as the Effingham Theatre, and later still as the East London Theatre (which burned down in 1879). Like the Pavilion Theatre down the road, the venue seems to have depended mainly on local working-class and immigrant (especially German and East European) audiences, being too far away from the city centre to attract the West End’s more well-heeled, floating clientele. The proprietor of Wonderland was Jonas Woolf, who spent £5,000 fixing up the building to comply with London County Council regulations, and who went all out to compete with the other local music halls. When Wonderland opened, Woolf traded heavily on the eclecticism and exoticism of his acts, putting together what the Era called a ‘curious exhibition of freaks’ for the hall’s first programme. Woolf also tried to drum up local support through a series of competitions, some of them designed to appeal to particular professions or social groups. So, there were contests for basket carrying (for market traders), carving up sheep (for butchers), shaving (for barbers), pram racing (for mothers), as well as others for singing, washing clothes, crawling, standing upside down, and more inventive tests of skill involving kicking a football through a hoop, and eating treacle from a swinging bread roll. Moving pictures were first shown at Wonderland in April 1896 in the form of R.W. Paul’s ‘Theatrograph’. Sadly, the show wasn’t a success, and managed to land Woolf in Clerkenwell County Court. As the Era reported in July that year, Paul was suing Wonderland, Limited, for failing to pay the sum of £22, 10 shillings – equivalent to three weeks’ rent of electrical accumulators to power the ‘Theatrograph’ kit. Woolf’s defence was that the moving pictures had come out ‘blurred and indistinct’. It was said that the audience at Wonderland ‘used to hiss the performance, and many people had demanded and received back their money’. Mr Gill (to Mr Woolf) – You say the “Theatrograph” was your star attraction, and that the losses of your music hall were due to its failure? Witness – The rest of the programme was mere padding. Mr Gill (reading from a poster) – Do you call the Bear Lady padding – “A native of Africa, full grown, whose arms and legs are formed in exactly the same manner as the animal after which she is named?” – Witness – Yes, the Bear Lady was padding. Witness – Yes, the Fire Queens also were padding. Mr Gill – I am not surprised that these monstrous exaggerations damaged your business. It was not the theatrograph. After all this, the judge decided that Woolf was at fault for failing to provide sufficiently powerful lighting, and ordered him to settle his debt to Paul. 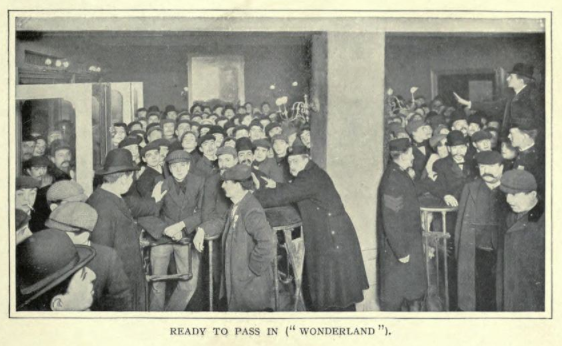 Undeterred, Wonderland carried on showing films on and off into the 1910s. But, as the venue continued to diversify the entertainments on offer, it became best known as one of the East End’s premier boxing halls. 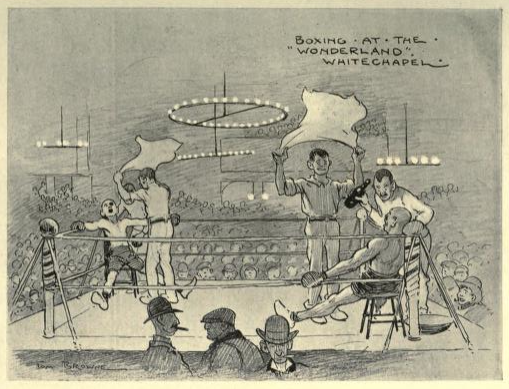 Robert Machray gives a virtual tour of a Saturday night boxing match in Wonderland in a guide to The Night Side of London from 1902. You pass into the building – at the door stands a solitary policeman. You pay, perhaps, the highest price, three shillings, which entitles you to a seat on the stage. You have come a quarter of an hour before the time announced for the beginning of the first match, but the vast building is already packed, except on the stage, where there is still room. And what a dense mass of human beings there is! Machray estimated that there were upwards of 2,000 people crammed into the auditorium. To add to the activity, there were also vendors selling refreshments. During the match, patrons could purchase oranges, cigarettes, soft drinks, plus ‘the greatest of East End delicacies, the stewed eel’. Wonderland seems to have been up and running again by the mid-1910s, and it’s listed as a film venue in the trade directories on and off until 1917. But in 1921 it was reinvented once more – this time as the Rivoli Cinema. Stanley Collins provided a lengthy, first-hand account of his time working at the Rivoli in the 1920s in a series of articles for the in-house magazine Gaumont-British News in 1932 (handily reproduced in a 2001 issue of the journal Picture House). Collins had been working as secretary to the US film producer and theatre manager Walter Wanger during his stint at the Covent Garden Opera House. When Wanger announced that he was taking over the Whitechapel Rivoli, Collins followed him, and was duly appointed Assistant Manager, with Hal Lewis as General Manager. As Collins remembered it, the Rivoli under Wanger and Lewis’s management became well-known for high-quality film programmes and variety acts. ‘The cream of the variety world, at some time or other,’ he wrote, ‘trod the boards of the Rivoli’s fine stage’. Collins was less effusive about the Rivoli’s audiences (‘not exactly genteel’), claiming that fights inside and outside the cinema were frequent. Collins had fonder memories of working with Ernest Trimmingham, known as ‘Trim’, a Bermudan playwright and stage actor then living in the East End, who (as Stephen Bourne shows) was probably also the first black actor to appear in British films. During Collins’s time as Assistant Manager, ‘Trim’ was acting as ‘a sort of “barker”‘ for the Rivoli, advertising the cinema around the neighbourhood. He also did a turn on the variety stage there to an enthusiastic house. He [Stewart] put the staff into smart new uniforms, and engaged five little blondes to open the main swing-doors to the theatre. Their smart blue pageboy tunics, short skirts, patent-leather leggings, white gauntlets and jaunty peak caps gave quite a “ritzy” touch to the front of the house. Even the four pageboys were supplied with white spats and gloves! Personally, I felt that Billy was overdoing it for Whitechapel, but I was wrong. Before long, people came from the West End to the Rivoli, so smart had the house become. The difference was so marked, in fact, that the ‘locals’ ceased their habit of dropping peanut shells under the seats, and the house at the end of a performance no longer resembled Brighton beach! There’s a tension in Collins’s description between ‘West End’ and ‘East End’ values. I wonder how the ‘locals’ he talks about took to these changes in décor and decorum? Did they welcome the presence of a more ‘ritzy’ venue on their doorstep, or were they nudged out by the new house policy? The Rivoli was taken over by the United Picture Theatres circuit in 1928 and by British Gaumont in 1930. 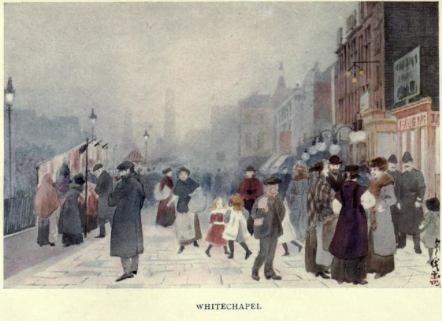 But, despite all this, like the venues on the site before it, the cinema continued to have some social connection to Whitechapel residents. Research by Gil Toffell has shown how it was especially important for the East End’s Jewish audiences. In the 1930s, it was one of the few places in London where Yiddish sound films were shown – films like The Voice of Israel (1930) and Uncle Moses (screened there in 1938). The auditorium was also known to host Rosh Hashanah services when the local synagogue proved too small to accommodate the number of worshippers. 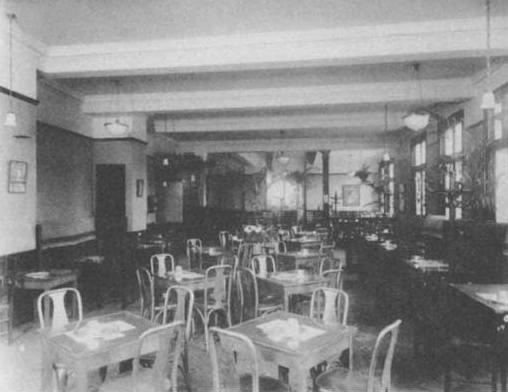 The Rivoli stayed open until 1940, when it was destroyed in an air raid. The bombed-out building was finally demolished in the 1960s. 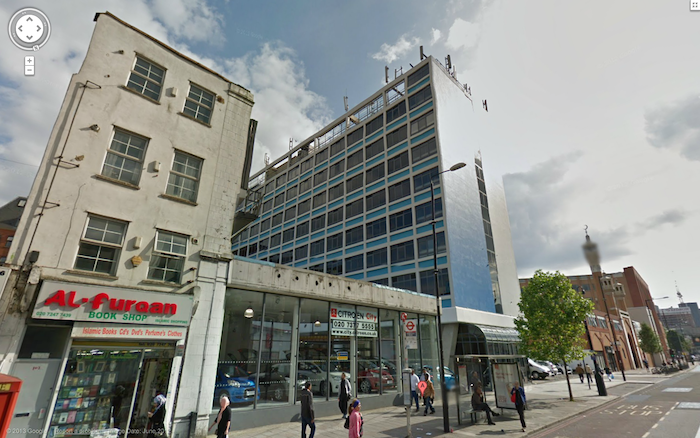 The site at 100 Whitechapel Road is now a Citroen car dealership, next door to the East London Mosque. The following sources contain information about Whitechapel, Wonderland, the Rivoli, and people associated with the venues. Feel free to add more in the comments section, if you know of any. ‘The “Theatrograph” in Court’, Era, 18 July 1896. ‘”Wonderland” Burnt Out’, The Times, 14 August 1911. Arthur Lloyd, ‘Pavilion Theatre and Wonderland, Whitechapel Road, Stepney’. Bourne, Stephen, Black in the British Frame: The Black Experience in British Film and Television(London: Continuum, 2001), pp. 7-9. Cinema Treasures, ‘Wonderland’ and ‘The Rivoli’. Collins, Stanley C., ‘Two Years at the Rivoli’, Picture House, 26 (2001), first printed in Gaumont-British News, beginning November 1932. Davis, Jim, and Victor Emiljanow, Reflecting the Audience: London Theatregoing, 1840-1880 (Hatfield: University of Hertfordshire Press, 2001). Eyles, Allen, Gaumont British Cinemas (London: BFI, 1996), p. 221. Hyatt, Alfred H., ed., The Charm of London: An Anthology (London: Chatto & Windus, 1912). Machray, Robert, The Night Side of London (Philadelphia: Lippincott, 1902). Newton, H. Chance, ‘Music-Hall London’, in Living London, ed. George R. Sims (1901-1903), vol. I, section ii, pp. 222-228. Nipperpatdaly, ‘East End Boxing Was Floored by the Flames’. Summerfield, Penelope, ‘The Effingham Arms and the Empire: Deliberate Selection in the Evolution of Music Hall in London’, in Popular Culture and Class Conflict, 1590-1914: Explorations in the History of Labour and Leisure, ed. Eileen Yeo and Stephen Yeo (Brighton: Harvester Press, 1981), pp. 209-240. Steelcroft, Framley, ‘Queer Competitions’, Strand Magazine, July 1897, 55-65. Toffell, Gil, ‘“Come See, and Hear, the Mother Tongue”: Yiddish Cinema in Interwar London’, Screen, 50:3 (2009), 277-298. Toffell, Gil, ‘Cinema-going from Below: The Jewish Film Audience in Interwar Britain’, Participations, 8:2 (2011), 522-538 (pdf). Institute of Hygiene, 33-4, Devonshire Street, Harley Street, W. 1. Prop[rietor]s, Institute of Hygiene. Res[ident] Sec[retary], Mr. A. Seymour Harding. Educational and Scientific Displays only, and by invitation chiefly. Largely used to illustrate lectures. No fixed programme or hours. First cinema installed in England for education work. The entry seemed so incongruous (it’s sandwiched between the Imperial Theatre, Edgware Road, and the Abbey Picture Palace in Merton) that I thought it warranted further investigation. What films were the Institute of Hygiene showing, and why were they showing them in the first place? And was it really England’s first educational cinema? Here’s what I pieced together. The Institute of Hygiene was founded in 1903, mainly to organize exhibitions about public health and preventative medicine. It also taught courses in hygiene for non-medical workers. The building at 33-34 Devonshire Street (a street that runs between Marylebone High Street and Great Portland Street) opened in the autumn of 1904. An issue of the British Journal of Nursing from the time explained that the central attraction at the Institute was ‘a permanent exhibition of hygienic products and appliances, and of articles of importance connected with personal and domestic hygiene’. Judging from the items mentioned in the BJN report, it seems that the Institute wasn’t averse to supporting its educational mission with a bit of product placement. Exhibits displayed ‘in the well-filled cases lining the walls’ included products from Nestlé, Cadbury’s, and other makers of ‘health’ foods and medical aids. The use of the cinematograph as a means of education was illustrated at the Institute of Hygiene, when numerous pictures were exhibited, some in particular showing how disease is spread by flies. The ways in which flies carry disease by crawling on stagnant fish, afterwards feeding on the sugar in the house, and, alighting on the mouthpiece of a child’s feeding-bottle were shown by films. Other pictures, taken by a London doctor, indicated the most practical methods of rendering first aid in case of accident, while a series of industrial films afforded insight into the manufacture of “nut margarine,” meat extract, and other foods. Sir William Bennett, the President of the Institute of Hygiene, in inaugurating the educational cinematograph, said that while in America the cinematograph had been used for the demonstration of the details of surgical operations, and pictures of germ life had been shown in London, the instruction by this means had in the main been merely sporadic or accidental, and secondary to amusement. This certainly seems like a pioneering use of moving pictures, even if William Bennett was selling his competition a bit short. There’s surely more than ‘accidental’ instruction at work in films like Charles Urban and F. Martin-Duncan’s series of ‘Unseen World’ pictures (the image at the top of this post comes from a 1903 ‘Unseen World’ instalment, Cheese Mites). But the point that early scientifically minded film shows tended to combine a large dose of amusement with their instruction is well taken: witness the famous Acrobatic Fly filmed by Percy Smith in 1910. Bennett was obviously trying to stress the seriousness of the Institute’s film screenings, and The Cinema went on to list some of the other ways that he intended to apply the new medium in the name of hygiene, like using microscopic images of germ life to teach food safety, or using film scenes to illustrate talks on domestic science and child-care. But, finding out about the Institute of Hygiene’s film work was a good reminder that, even when there was no shortage of dedicated cinemas around in London, films were still shown in a wide range of contexts, and for plenty of reasons other than commercial entertainment. In their recent edited collection of essays, Useful Cinema, Charles Acland and Haidee Wasson make a strong case for paying more attention to the history of what they call the ‘other cinema’: one that has always existed alongside the more familiar world of film-as-entertainment, but which instead set out to ‘transform spaces, convey ideas, [and] convince individuals’. Even if it wasn’t the direction that the mainstream film business ultimately took, the idea of cinema as a force for education did a lot to convince people in the early days, especially, that there was a future for moving pictures – and a useful future, at that. Since coming across the Institute of Hygiene’s entry in the Kine Year Book, I’ve found references to a few more non-theatrical venues in London (besides churches and local halls) that seem to have shown films on a regular basis. 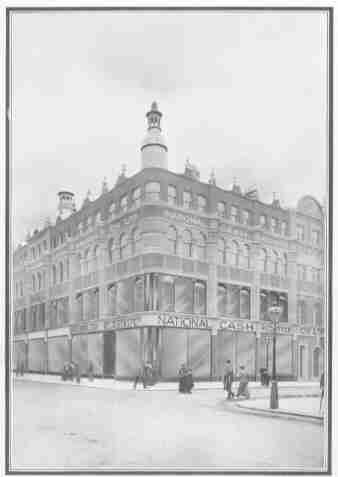 Situated at 223, Tottenham Court Road, was the London office of the National Cash Register Company. This was licensed to show films in its ground-floor hall ‘for trade purposes only’ as early as 1914. From what I can gather, it looks like this was the company’s national sales headquarters, so it’s possible that films were used to train employees in sales techniques. 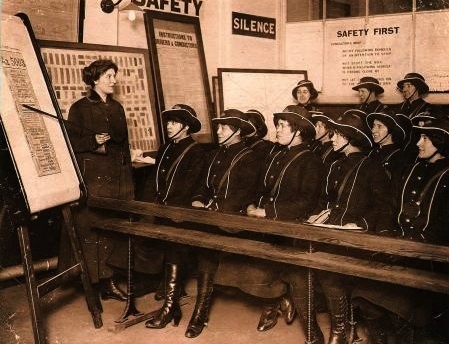 According to an article in The Times in May 1913, trainee drivers in the Milman Street depot were shown something like modern road safety films. ‘Cinematograph demonstrations were used in instructing the staff for showing how common forms of accident might be avoided’, with vehicles in the films ‘arranged to make close resemblance to actual accidents’ for extra authenticity. These examples probably just scratch the surface. We’ve become accustomed to seeing moving images everywhere in cities now, but I wonder what other early film shows were going on in unexpected corners of London. The collection of essays edited by Charles Acland and Haidee Wasson is Useful Cinema (2012). Simon Popple and Joe Kember mention the idea of using film to train London omnibus drivers in their introduction to Early Cinema (2004), which also includes a discussion of some of the other potential applications for the cinematograph. These are the Plaza Tiller Girls, as painted by Walter Sickert in 1928. I came across this image whilst I was trying to find out more about the stage shows that used to accompany film screenings in some of the bigger London cinemas. The Tiller Girls got their name from the entrepreneur John Tiller, who started training dancers in Manchester in the 1890s, and later set up a school in London on Charing Cross Road. Once trained, a successful dancer might work in a touring group or a revue, or else join one of the Tiller troupes associated with a particular venue. 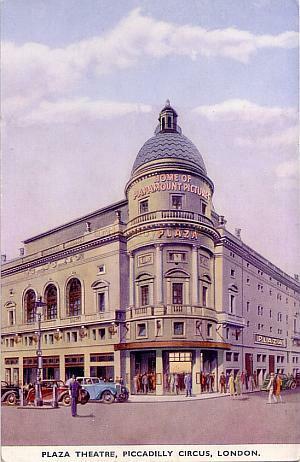 Postcard of the Plaza Theatre, from the Arthur Lloyd website. The troupe in Sickert’s painting was attached to the Plaza Theatre on the corner of Lower Regent Street and Jermyn Street, facing out towards Piccadilly Circus. The Plaza was a plush, 1,896-seater venue, which opened in 1926 as the London home of Paramount Pictures. In common with other big cinemas built around this time, the Plaza was designed with a capacious stage as well as a screen, perfect for showcasing variety acts either before or in between films. To take one random example of the kinds of “cine-variety” programme this could result in, in May 1927 the theatre was advertising a run of the Gilda Grey film Cabaret, coupled with the Richard Dix and Betty Bronson film Paradise for Two, plus stage turns from the Tiller dancers and the musical act “Kel Keech and his Banjolele Banjos“. I’m not sure whether Walter Sickert shared Kracauer’s understanding of the Tiller Girls. For a start, there’s not much machine-like about the movements on display in his painting. In fact, Sickert seems to have gone out of his way to make the show look raw and spontaneous. 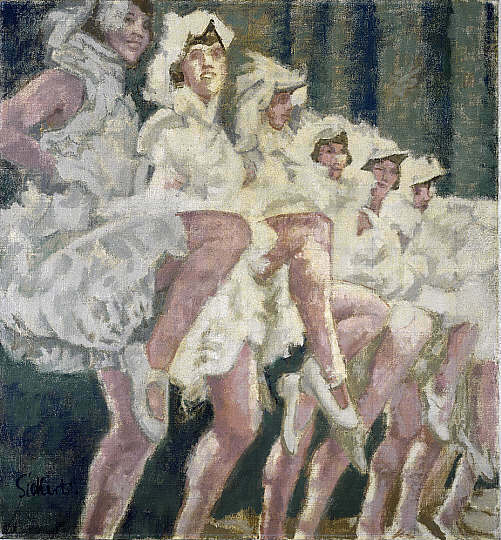 There’s a story that the Plaza dancers were disappointed by Sickert’s depiction of them because their legs and heads were all shown moving in different directions. And, despite the slightly chilly colour palette, the row of heads and musical instruments huddled around the stage give the scene a feeling of intimacy. Whatever he thought of them, Sickert was obviously intrigued by the Plaza troupe. He painted another picture of them in 1928 (minus the silhouetted figures in the foreground), and again in 1938, in a much larger canvas exhibited as High Steppers. Sickert’s second painting of the Plaza Tiller Girls in 1928, from the Bridgeman Art Library. 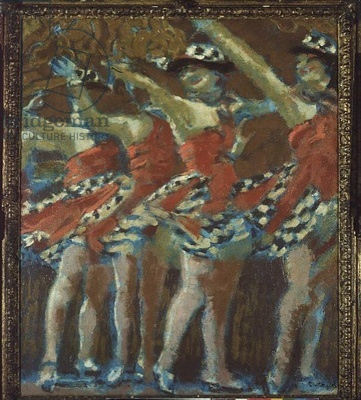 Sickert’s painting High Steppers, 1938, from the National Galleries of Scotland website. It’s doubtful, though, that Sickert ever saw the Tiller Girls in action. According to the art historians Wendy Baron and Richard Shone, Sickert worked mainly from photographs during the later part of his life. The source for High Steppers was most likely a publicity still printed in the London Evening News in 1927, which advertised the Plaza troupe’s appearance in the film A Little Bit of Fluff (starring Betty Balfour and Syd Chaplin). His 1928 Tiller Girl paintings were probably also based on publicity photos, rather than first-hand observation. If we’re looking for something specifically modern about these paintings, perhaps we could find it not just in the subject matter, but also in Sickert’s multi-media working methods. There’s definitely something a bit dizzying in the flow of images from stage to screen to newspaper to art gallery. There were Tiller Girls at the Plaza until at least 1931, when they were sharing the bill with the American musician Eddie Peabody (another banjo player) and the “jungle picture” Rango. 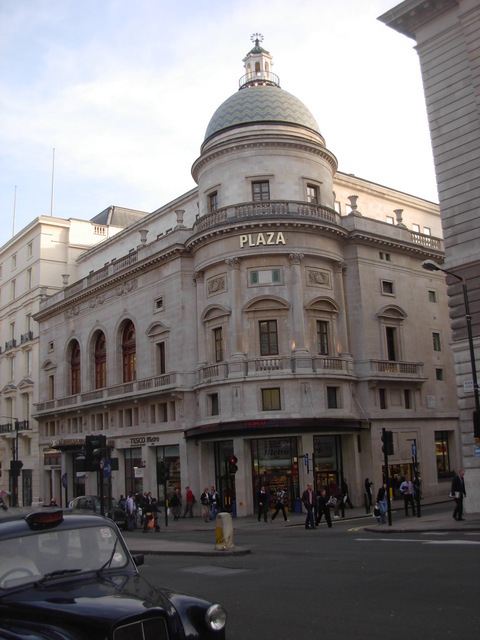 The Plaza Theatre itself is now the site of the Apollo Cinema, Piccadilly Circus, and a Tesco supermarket. The site of the Plaza Theatre photographed in 2007, from the Cinema Treasures website. There’s more about the Plaza Theatre and its afterlife in London’s West End Cinemas by Allen Eyles and Keith Skone. The book Tiller’s Girls by Doremy Vernon contains reminiscences from women who worked as Tiller dancers, as well as some great illustrations. I got most of my information about Sickert’s paintings from the 1992 exhibition catalogue produced by Wendy Baron and Richard Shone for the Royal Academy of Arts. The Tate website also has a detailed profile of Sickert, which talks about his career-long fascination with popular culture.